We all know we shouldn’t be lazy when it comes to our winter skincare regime. Yet every year when the colder months come around, we find ourselves slacking on the routine we were so dedicated to, during the summer. It’s easy to become indifferent to skincare when you’re covered by a ton of layers, but trust us when we say, your skin will thank you for being attentive year-round! Here are a few tips to keep in mind when updating your winter skincare routine. ZO Skin Health’s first steps to achieving healthy skin are; cleanse, scrub and oil-control. These objectives enable the skin to function properly and to tolerate all daily exposure and activities. You can correct and restore the surface texture of your skin through exfoliation. Exfoliating promotes skin-cell turnover and avoids a build up of dead skin cells to allow your skin to look it’s freshest. Remember to ensure that your daily primer or cream has SPF such as our Oclipse Sunscreen + Primer in SPF30. UV rays can still damage your skin even in winter so an SPF is always essential. As the temperatures drop and indoor heating rises, it will cause your skin to become dull and lack-lustre. So after you’ve cleansed your face, it’s essential that you strengthen your skin and restore normal hydration to it. ZO’s Ossential Daily Power Defense is the perfect serum as it speeds up the skin’s natural mechanism to repair DNA damage and protect against future oxidative damage. In addition to providing antioxidant protection to combat free-radical damage and restore the skin’s barrier system. During the summer you’re constantly drinking water because of the warmer weather but in the winter it’s still just as important to keep yourself hydrated. It doesn’t matter how good your skincare routine is, if you’re not drinking enough your water, your skin will be negatively affected. Alongside a healthy supply of water, your body also needs as good a diet as ever, so avoid the comfort foods and stick to healthy alternatives. Have you been religiously following your skincare routine only to find that your skin is still punishing you with random breakouts? You may be commiting a skin sin without realising! It’s safe to assume that your phone is a part of your everyday life. Through a combination of you constantly touching it, leaving it lying around on various dirty surfaces, and possibly dropping it on the floor (yikes! ), your phone is ridden with grime and bacteria that you can’t see! 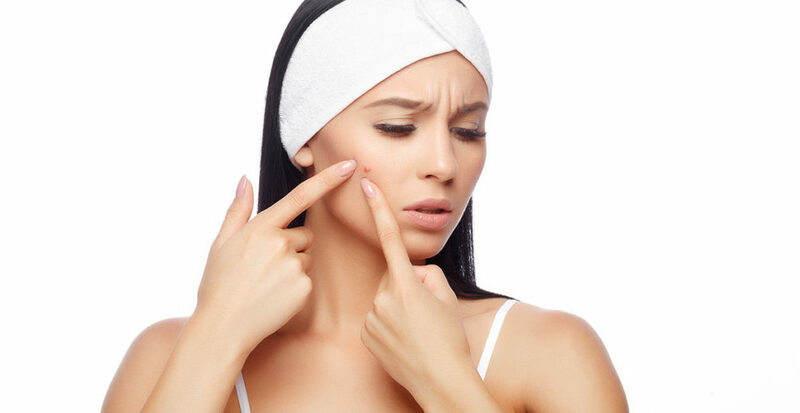 So sudden breakouts could very well be caused by you placing your dirty phone on your face when you make a call. The solution? It’s actually very simple. All you need to do is wipe it down each day with some sort of antibacterial wipe and you’re good to go! If your exfoliating too much you’re likely stripping your skin of the natural oils it needs to keep your skin healthy. as a defense mechanism, your skin kicks into overdrive and produces an excess amount of sebum, resulting in oily skin and consequent spots. While we’re not saying that you shouldn’t exfoliate, but as a general rule keep it to a minimum of 1-2 days. Though, you should keep in mind that different skin types require different skincare regimes. Makeup brushes are a breeding ground for dirt, oil, and bacteria. So, it is essential that you regularly wash your makeup brushes (at least once a week). You can either purchase a cleanser specifically designed for makeup-brushes or for those who are like a good beauty hack, soap and water works just as well but make sure that the soap isn’t too harsh! If you use the same towel for your hair, body and face, STOP IT NOW. By using the same towel, you’re transferring the oils from your hair and body to your face causing unexpected breakouts. sugar is more well-known for being bad for your health, it can also wreak havoc on your skin. It leads to glycation, a process in which excess glucose molecules cling to your collagen, distorting it and leading it to be stiff. So consider cutting out or at least cutting down on dairy and sugar from your diet and see how your skin improves. Keep in mind that for a healthy diet everything should be in moderation no matter how good the food may seem!